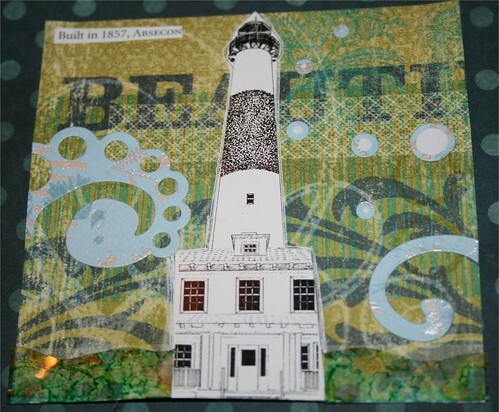 Absecon Lighthouse, NJ 4" x 4 " Collage Card, originally uploaded by DianthusMoon. I started shopping way early in the morning and was pleased with making a few purchases this early. Found things for both fellows that they will be surprised to receive. I got some things off of Sean’s wishlist (most of it, he doesn’t have a big one) later in the morning. I still like to hit stores like Marshalls, Home Goods and TJ Maxx. Scored a few things for mom the other night at Tuesday Morning. Speaking of mom, she bought or got me the bookmark at the Absecon lighthouse in NJ a few summers ago. I thought it would work on the 4″ x 4″ Collage and it almost fit! I used some ‘beautiful’ scrapbook paper (you can see the actual word here) and die-cuts. The neat part is the bottom which was handmade by a lady in one of my Flickr groups. We send each other things like this, which inspired me to do the cards. I’ve only been stuck a few times-this is about card #95! I haven’t made too many Artist Trading Cards (the ones I show are bigger of course). I need to do a matchbox next for an exchange. My brother who lives with my mom got a brand new vehicle. I wish I could be happy for him as he just turned 50 a few days ago. He never picks up the phone or speaks to me when he sees me or my guys. If he drives my mom around a lot I’ll be happy for her. He is holding a grudge and saying I didn’t help him and mom a few weeks ago. I was having issues and my van can’t be driven that far. Cross that bridge already! Thinking about seeing the Longwood Garden Christmas display, but I have to see how cloudy it is tomorrow as heavy rain is coming later. Oh! And the ABS and brake light issue-the poor van needed brake fluid!